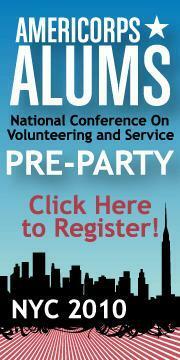 I just wanted to remind you that AmeriCorps Alums is coming to NYC next week! Whether you decide to come to our party (featuring live comedy and Brooklyn-based indie pop band Modern Medical Miracle) or volunteer with us, be sure to get in on some of the fun on Sunday! You can sign up for the party here… service project details are below. Date and Time: Sunday, June 27th from 10am-2pm. Directions: Take the A train to 190th St. Exit near intersection of W 192nd St and Bennett Ave (exit down the ramp). Walk North on Bennett, towards Broadway, and make a left onto Nagle. Make a right onto Ellwood, the main entrance is on Ellwood. OR Take the 1 train to Dyckman St. Exit near intersection of Dyckman St and Nagle Ave. Start out going West on Nagle Ave towards Hillside Ave. The school entrance is on Ellwood. Project Info. : Volunteers will revitalize this public elementary school by building planter boxes and planting them with flowers around the outside of the school. Lunch and snacks will be provided. Volunteers should wear clothes they won’t mind getting dirty and all other supplies will be provided.